The Field Notes Black Ice has a glossy foil stamped cover in silvery-black metallic foil that looks like black ice. Each edge is then bound with an orange spine, without staples, and the text on the cover is then embossed for the perfect finishing touch. Each Field Notes Black Ice notebook comes with Bright White” Finch Fine Smooth 70# text 3½" × 5½" paper that is lined in "Frost Gray" and a double-rule of “DDC Orange” on the top of the pages. The Field Notes Black Ice notebooks come in a 3 pack. 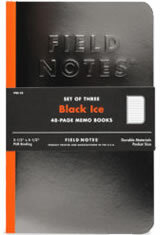 The Field Notes Black Ice Memo & Notebooks usually ships within 1 business day unless otherwise specified. Each Field Notes Black Ice Memo & Notebooks we sell is guaranteed to be genuine, authentic and will arrive brand new & unused! They arrived today and better than expected. There was a little blip in the order but well worth getting here a couple days after my original order. Customer service is excellent!!! !